We are proud to be the ONLY Fitness Group in Western Canada to be using the state-of-the-art Polar Body Age System! The Polar BodyAge System is more than a fitness assessment. It is a whole new way of letting you know how healthy you could be. The BodyAge analysis is an exclusive health & fitness assessment developed by Polar to quickly and simply provide health club members with a baseline measurement of their overall fitness level. The BodyAge assessment takes into account a number of health and fitness markers including a person’s strength, flexibility, percentage of body fat, nutrition, cardiovascular fitness and more to calculate the fitness of their body. 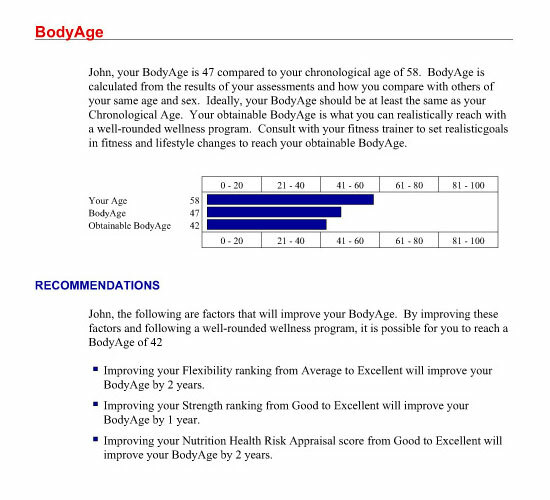 The program will provide you with a BodyAge score indicating whether you are above or below your current biological age. For example, if someone is 35 but their BodyAge is 45, there are steps that can be taken to work to improve BodyAge and overall health and fitness. The system provides members a BodyAge score and a complete fitness program to enable them to reach their Youngest Obtainable BodyAge score. If you are interested to assess your physical condition please download and fill Physiological_Bodyage_Quiz and email it to us for evaluation.